Designed for ultra long range surf casting, and as a Big Pit carp reel, the Penn Affinity’s specification includes a long tapered, forged aluminium spool and slow oscillation movement for the perfect line lay to achieve maximum distance with, both mono and braided lines. With strategically placed stainless steel ball-bearings, the reel is smooth under load, but also features a quick turn drag system, a titanium main shaft and manual bale arm, also a rotor brake system. These incredible reels are supplied with aluminium spools, one deep for mono and one shallow for braid, plus are fully saltwater resistant. 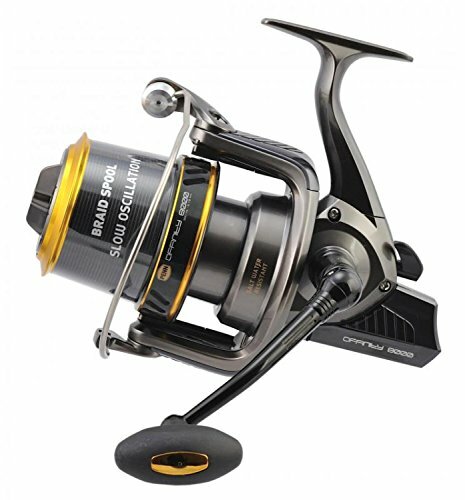 With 2 models available, 7000 and 8000, both reels come supplied with 2 lightweight aluminium spools, a standard spool for normal nylon monofilament and a shallow braid spool. Ratio: 4.2:1. Long stroke forged aluminium spool. Titanium main shaft and bail wire. Fully salt water resistant. Smooth ‘quick’ turn drag system. Machined aluminium handle. Stainless steel shielded ball bearings. Slow oscillation. Rotor Brake System. Manual Bail Arm. 7000 Capacity: 270m – 0.18mm and 300m 0.40mm. Line retrieve: 85.7cms (33in). Weight: 642gms. 8000 Capacity: 300m – 0.18mm and 340m 0.40mm. Line retrieve: 98cms (37in). Weight: 715gms.